This plant came in a terrarium. It has dwindled to just these few leaves and I'm not sure what to do for it. I repotted it in new pot and soil, but don't know what it is so I can't figure out what it needs. I was thinking maybe a fern of some sort? Any ideas? Thanks! It's hard to tell from the withered leaves, but it might be a schefflera. It needs bright, indirect sunlight. Let the soil completely dry out, and then soak the plant. Thanks Judy for your response. I am pretty sure this isn't a schefflera. The leaves are not rubbery, thick, or a dark green when this plant is healthy. They are a light green, sort of leathery, and tend to have 3 lobes -- one long center piece and then two short lobes on each side near base of leaf. When a new leaf comes in it is long and then develops the side lobes. Ooooh - yes, I just looked up walking fern and this looks like the plant! I'm in Illinois and won this in a raffle that was part of a local farming event. I think you've hit on it @attosa. Thanks! You may be correct about this being a walking fern but your leaf looks like a 3 prong leaf (?) and I do not think there is a leaf like that in the walking fern family. 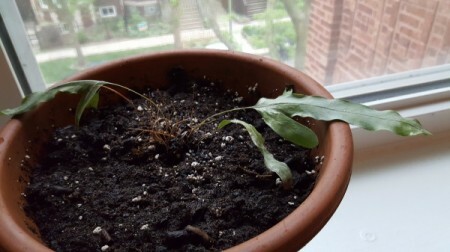 Does your plant look like it would grow from where the tip of the leaf hits the dirt/ground? That is why this fern is called a walking fern. If it does that, then you have probably identified your plant correctly. Hi cybergrannie and thank you for your response. I don't know what the leaf should look like to indicate it would grow from the tip of the leaf if it's hitting dirt. It's very warm now in Chicago, and the plant was just looking worse and worse inside so I put it outside in my garden under a large peony. It's getting a bit of dappled light and it's well watered. It's looking better every day. The leaves are up in the air now - well 2 of them are. 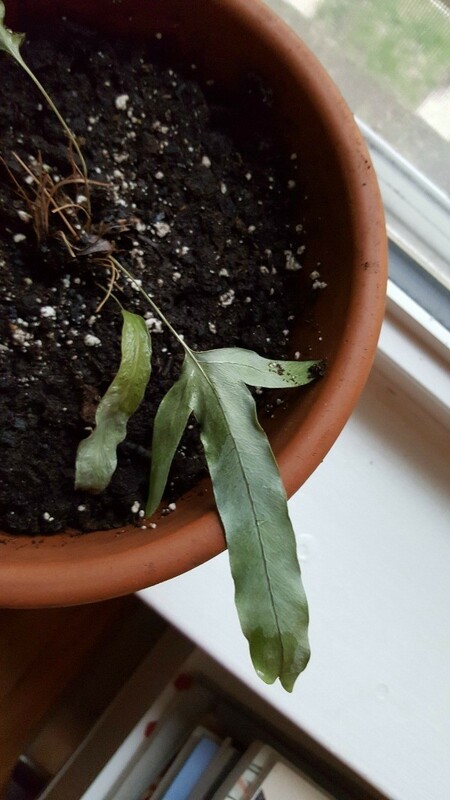 There is one leaf where the tip is touching the dirt, but nothing is growing where it touches? I will post back and let you know if anything develops. Do you have another idea about what this plant could be? I'll take it! Thanks so much! Hi - I'm glad your plant is doing better. You can usually be safe with an unknown plant if you do not place it in direct sun, keep it medium to dry (not too wet) and water when soil feels dry an inch or so down. Patience is usually needed for a new plant. Here is a site that you might want to try - just put your zip code and you will see an office near you. Give them a call and ask them for help as I have always found my agency to be very helpful. Good luck and keep us posted (sometimes it takes a few days for someone to read a new message).